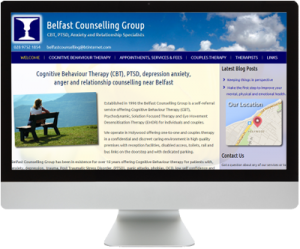 The Belfast Counselling Group was established in 1996 to offer services such as Cognitive Behaviour Therapy, Post Traumatic Stress Disorder Therapy and provide support for those suffering from anger depression and relationship counselling. The practice is registered with all the leading health insurance providers and offers one to one counselling services at their clinic in Holywood, Co Down. We built a new website for the group to include the ability for them to keep a blog, the blog will be used to update customers on the different types of therapies that they offer as well as provide tips on controlling stress and managing day to day anxiety. An interactive map allows customers to quickly find the groups offices and this eye-catching site is also responsive meaning it can be viewed easily on a wide range of mobile devices.